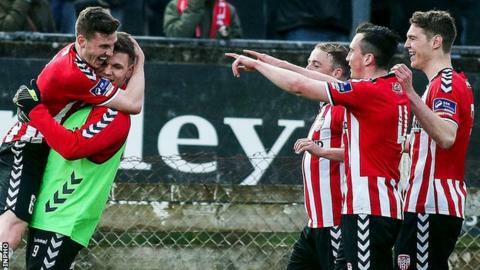 Derry City moved top of the Premier Division with an impressive victory over Rovers at the Brandywell. City made a blistering start with Ronan Curtis slotting in before Harry Monaghan's header made it 2-0. Rory Patterson sealed the win in a dominant Candystripes display by netting a second-half penalty. Derry are three points clear but champions Dundalk will regain top spot on goal difference if they beat Longford Town on Saturday night. City have been rejuvenated under new boss Kenny Shiels and they continued their excellent start to the campaign. The host seized control from the opening seconds and had already gone close before Curtis finished at the back-post after just two minutes. Monaghan doubled the lead on 23 minutes, the Scotsman's powerful header hitting the roof of the net from a pinpoint Barry McNamee cross. Patterson almost added a third when he saw his audacious lob clawed away by keeper Barry Murphy. Rovers started the game just a point behind Derry in third but they rarely threatened, although Gary McCabe fired narrowly wide early in the second half. Patterson's penalty in the 58th minute, awarded after he was hauled down by David Webster, ended hopes of a comeback and this one-sided affair fizzled out.